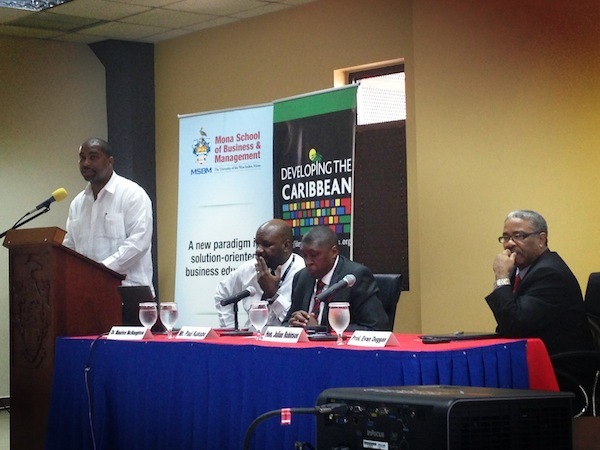 Open data is fundamental to democratic governance and development, say Jamaican officials and academics. Creating the conditions for startups to form is now a policy imperative for governments around the world, as Julian Jay Robinson, minister of state in Jamaica’s Ministry of Science, Technology, Energy and Mining, reminded the attendees at the “Developing the Caribbean” conference last week in Kingston, Jamaica. Robinson said Jamaica is working on deploying wireless broadband access, securing networks and stimulating tech entrepreneurship around the island, a set of priorities that would have sounded of the moment in Washington, Paris, Hong Kong or Bangalore. He also described open access and open data as fundamental parts of democratic governance, explicitly aligning the release of public data with economic development and anti-corruption efforts. Robinson also pledged to help ensure that Jamaica’s open data efforts would be successful, offering a key ally within government to members of civil society. The interest in adding technical ability and capacity around the Caribbean was sparked by other efforts around the world, particularly Kenya’s open government data efforts. That’s what led the organizers to invite Paul Kukubo to speak about Kenya’s experience, which Robinson noted might be more relevant to Jamaica than that of the global north. Kukubo, the head of Kenya’s Information, Communication and Technology Board, was a key player in getting the country’s open data initiative off the ground and evangelizing it to developers in Nairobi. At the conference, Kukubo gave Jamaicans two key pieces of advice. First, open data efforts must be aligned with national priorities, from reducing corruption to improving digital services to economic development. “You can’t do your open data initiative outside of what you’re trying to do for your country,” said Kukubo. Second, political leadership is essential to success. In Kenya, the president was personally involved in open data, Kukubo said. Now that a new president has been officially elected, however, there are new questions about what happens next, particularly given that pickup in Kenya’s development community hasn’t been as dynamic as officials might have hoped. There’s also a significant issue on the demand-side of open data, with respect to the absence of a Freedom of Information Law in Kenya. When I asked Kukubo about these issues, he said he expects a Freedom of Information law will be passed this year in Kenya. He also replied that the momentum on open data wasn’t just about the supply side. With respect to leadership, Kukubo pointed out that newly elected Kenyan President Uhuru Kenyatta drove open data release and policy when he was the minister of finance. Kukubo expects him to be very supportive of open data in office. The development of open data in Jamaica, by way of contrast, has been driven by academia, said professor Maurice McNaughton, director of the Center of Excellence at the Mona School of Business at the University of the West Indies (UWI). The Caribbean Open Institute, for instance, has been working closely with Jamaica’s Rural Agriculture Development Authority (RADA). There are high hopes that releases of more data from RADA and other Jamaican institutions will improve Jamaica’s economy and the effectiveness of its government. Open data could add $35 million annually to the Jamaican economy, said Damian Cox, director of the Access to Information Unit in the Office of the Prime Minister, citing a United Nations estimate. Cox also explicitly aligned open data with measuring progress toward Millennium Development Goals, positing that increasing the availability of data will enable the civil society, government agencies and the UN to more accurately assess success. Developing the Caribbean focused on the demand side of open data as well, particularly the role of intermediaries in collecting, cleaning, fact checking, and presenting data, matched with necessary narrative and context. That kind of work is precisely what data-driven journalism does, which is why it was one of the major themes of the conference. I was invited to give an overview of data-driven journalism that connected some trends and highlighted the best work in the field. I’ve written quite a bit about how data-driven journalism is making sense of the world elsewhere, with a report yet to come. What I found in Jamaica is that media there have long since begun experimenting in the field, from the investigative journalism at Panos Caribbean to the relatively recent launch of diGJamaica by the Gleaner Company. diGJamaica is modeled upon the Jamaican Handbook and includes more than a million pages from The Gleaner newspaper, going back to 1834. The site publishes directories of public entities and public data, including visualizations. It charges for access to the archives. 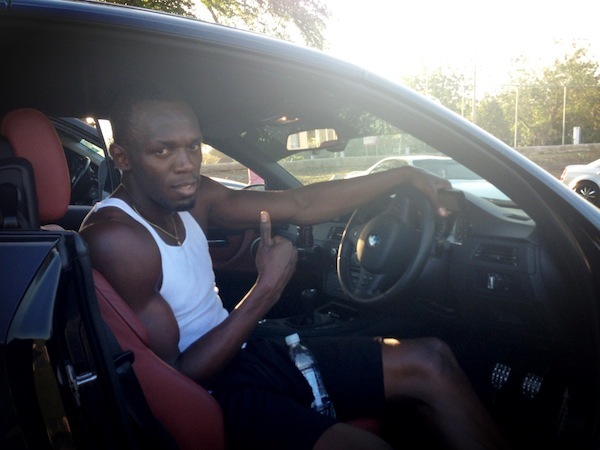 Olympic champion Usain Bolt, photographed in his (fast) car at the UWI/Usain Bolt Track in Mona, Jamaica. Normally, meeting the fastest man on earth would be the most memorable part of any trip. 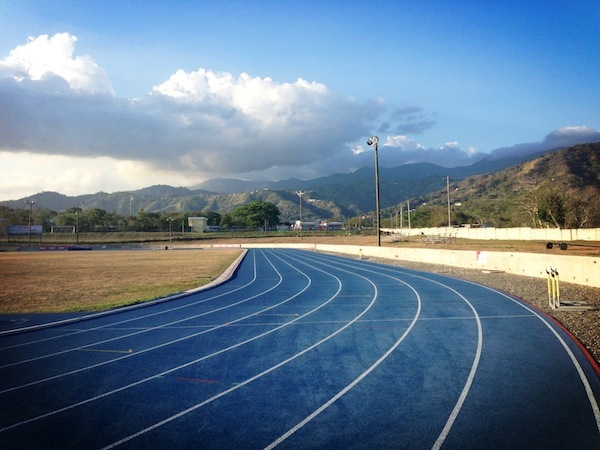 The moment that left the deepest impression from my journey to the Caribbean, however, came not from encountering Usain Bolt on a run but from within a seminar room on a university campus. As a member of a panel of judges, I saw dozens of young people present after working for 30 hours at a hackathon at the University of the West Indies. While even the most mature of the working apps was still a prototype, the best of them were squarely focused on issues that affect real Jamaicans: scoring the risk of farmers that needed banking loans and collecting and sharing data about produce. The winning team created a working mobile app that would enable government officials to collect data at farms. While none of the apps are likely to be adopted by the agricultural agency in its current form, or show up in the Google Play store this week, the experience the teams gained will help them in the future. As I left the island, the perspective that I’d taken away from trips to Brazil, Moldova and Africa last year was further confirmed: technical talent and creativity can be found everywhere in the world, along with considerable passion to apply design thinking, data and mobile technology to improve the societies people live within. This is innovation that matters, not just clones of popular social networking apps — though the judges saw more than a couple of those ideas flow by as well. In the years ahead, Jamaican developers will play an important role in media, commerce and government on the island. If attracting young people to engineering and teaching them to code is the long-term legacy of efforts like Developing the Caribbean, it will deserve its own thumbs up from Mr. Bolt. The track to that future looks wide open. Disclosure: the cost of my travel to Jamaica was paid for by the organizers of the Developing the Caribbean conference.